Fountain Hills High School has amazing and unprecedented technology that allows our students to learn on the latest computers and software. Our virtual reality lab consists of the most powerful Dell computers on the market with maxed out specs and Oculus Rift and HTC Vive VR headsets. Our Mac lab has the latest iMacs with maxed out specs and the latest graphics cards to ensure there is no limit to our students' creativity. We offer training and access to the latest professional software programs like Autodesk Maya, Adobe Creative Suite, Apple Final Cut Pro, and many others. 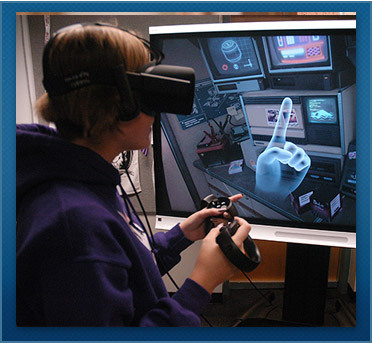 Students in our 3D Animation program can create in the 3D environment, then interact with their creation in virtual reality and print it on our 3D printers. We also offer coding classes, one introductory class and one AP level course. Students learn coding in our coding lab which offers students access to additional high-end Dell computers. With over 750 computers on our campus and approximately 500 students, all students have access to the latest and greatest technology. Randy was born in Huntington, West Virginia, and is a 2003 graduate of Arizona State University. Randy has been a teacher at FHHS since 2003. He enjoys watching sports, reading, and spending time with his family. He and his wife, Christine, enjoy the blessing of three children, Ashley, Alexandra, and Kyle. Ashley and Alexandra are both graduates of FHHS.